Keith Ellison is right to warn Democrats that a battle in one state has nationwide implications. There is, unfortunately, nothing new about the assault on democracy that is playing out in North Carolina. But Democrats need to make a new commitment to defending democracy—and Congressman Keith Ellison is giving voice to that commitment. Promising an all-out fight against efforts by North Carolina Republicans to mangle the message of the 2016 election in their state—by dramatically disempowering a newly elected Democratic governor—the contender for the chairmanship of the Democratic National Committee is proposing to remake the Democratic Party as an aggressive force not just for big-“D” Democratic candidates but for small-“d” democratic renewal. Ellison recognizes that, while this fight may focus initially on North Carolina, it is a national struggle. He also recognizes that this is an old fight. Meddling with the rules to undermine, weaken, and dismiss the will of the people is nothing new. In the “Old South” of overt segregation and Jim Crow governance, politicians regularly changed the rules in order to assure that democracy would not become a burden to the existing order. Poll taxes and literacy tests were imposed to deny African Americans, Latinos and poor whites the franchise. Along with official and semi-official threats of violence, these moves warped the politics of the region and the nation for generations. Yet the voters sometimes broke with the old order—or, at the least, threatened to do so. When that happened, conniving partisans went to work: creating new voting systems, governing structures, and practices with an eye toward keeping control. They initiated runoff elections, which were timed to assure that Democratic primaries did not nominate reformers. They created primary- and general-election systems that gave rural counties what was effectively veto power over statewide results. And if all else failed, they rewrote election rules altogether—as happened in Louisiana in the 1970s. Thwarted in his efforts to upend term limits in Alabama, Governor George Wallace simply ran his wife Lurleen for governor in 1966 and then proceeded to govern as a “dollar-a-year-adviser” charged with making all the important decisions. Reworking rules and practices to thwart democracy is an old Southern tradition, but it is certainly not an honorable Southern tradition. And lest Northerners get to feeling too superior, it is worth noting that every region of the United States has seen its share of electoral pathologies. For a brief “New South” moment, it even seemed as if changing Southern states such as North Carolina might lead not just the South but the nation in charting more democratic courses. In recent years, however, North Carolina has stumbled backward—with right-wing Governor Pat McCrory and his legislative allies undoing decades of progress to expand voting rights, competitive elections, and forward-looking governance. Thanks to brilliant activist campaigns, including the “Moral Mondays” movement, McCrory and his cronies have been exposed and challenged. And this fall the governor was narrowly defeated in one of the most important victories of the year for democracy advocates. Unfortunately, McCrory is not exiting gracefully. He refused for weeks to concede his defeat. And then he started rewriting the rules in order to disempower his successor: Democrat Roy Cooper. Days before he is to leave office, McCrory has signed sweeping legislation designed to limit Cooper’s authority in general and to rework election processes in particular. “Most people might think this is a partisan power grab, but it’s really more ominous,” says Cooper, who has raised the prospect of legal challenges to unconstitutional rule changes. These changes represent deep violations of the democratic process, and the faith that voters place in the elected process. To these legislators, who were elected under racially discriminatory redistricting plans, we say that this madness must end now and the people’s vote must be respected. The assault by McCrory and his allies on democracy in North Carolina cannot be dismissed as merely a North Carolina crisis. It is not just a Southern issue. It is a national issue—especially as Donald Trump and his authoritarian allies place their grip on the federal government. And it is an issue that Democrats must recognize as a fundamental fight for 2017 and beyond. This is something that Ellison understands. Ellison is not just another top Democrat. As a contender for the chairmanship of the Democratic National Committee, he is signaling that he wants the DNC to take the lead in fights to write rules that favor (rather than thwart) democracy. “The DNC has an election protection program and this is at the heart of their mission. 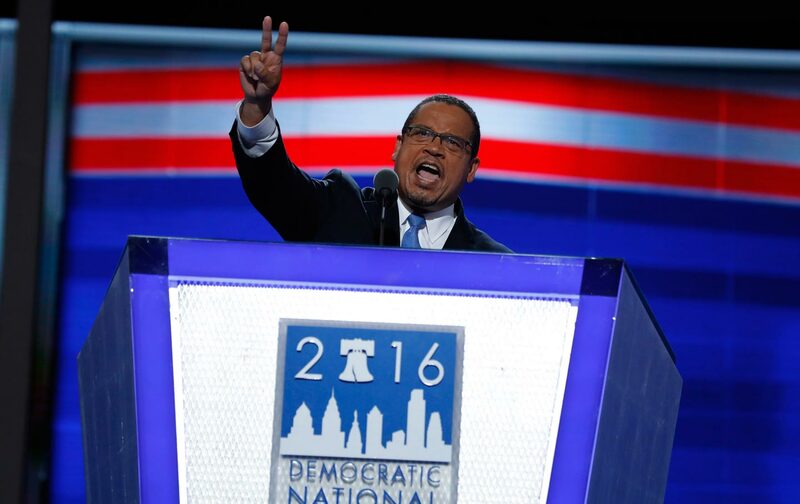 It needs to step up right now to say this is outrageous, and get lawyers to oppose this undemocratic action that is happening right now,” says Ellison. The battle against the past and for the future is on—in North Carolina and nationally. Ellison makes a vital point when he argues that this battle must be at the very heart of the renewed mission of the Democratic Party.